Each year it seems that just as our family and friends go on holiday, their garden produce comes to fruition and they have to hand it out to us all so it won't waste whilst they are away. I always finish August making Preserves of one sort or another. It is very satisfying to see jars and bottles of preserves and cordials with pretty labels, ready to see us through winter... if they last that long. So far this summer I have made Courgette ( Zucchini ) loaves and put them in the freezer, elderflower cordial and rhubarb cordials. These have no chemicals, preservatives and less sugar than bought cordials so are better for the children. Today, I have made apple and blackberry jam and also rhubarb and orange jam. Before Christmas, I will make my Red Onion Marmalade that everyone loves on Christmas Eve with pates, pork pies and hams. There are dozens of recipes online and I am sure you will find the ones to suit your lovely families. We like these. When I was a child my dad had plum trees, rhubarb crowns and blackcurrants in the back garden. We always ate what was in season. Mum could have blackcurrants picked and preserved as jams or chutneys within half an hour of them being picked. To this day my favourites are Plum jam and Blackcurrant jam. Taking this one step further, I also make cordials and use my home-grown raspberries or wild fruit we have foraged and also loaves with herbs or vegetables. By my front door I have mint plants. A sprig of mint in a mug of warm water and add half a lime for a mint and lime infusion. This will help you start the day really well if taken in the morning. The first cordials I make of the summer are always Elderflower cordials. 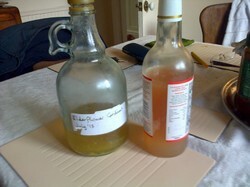 My daughter in law picks the elderflowers and we each make the cordial. There are several recipes online for cordials. I always add some citric acid to help it stay fresh longer. Sometimes I use the bottles I bought years ago. Sometimes I save bottles and reuse them as in the one on the right. I spent this morning making jams and hopefully these will last us and our sons' families through the winter. I used the rhubarb from my garden. Yes there is some left after giving some away, eating some in crumbles and also making cordial. I started off by sterilising the jars. This is done by putting them in the hot oven about 110C to kill off any bacteria. Any preserves should always go in washed, oven sterilised jars. I always use a proper jam thermometer. It takes all the guess work out if you boil the jam to the line it states on the thermometer. Easy. Some fruits don't have a lot of natural setting agent, pectin, in them so it is a good idea to help setting by adding some orange or lemon to the mixture. I sometimes add the zest too. I added chopped rhubarb, chopped ginger. zest and juice of 2 oranges and warmed sugar to the pan, boiled it up and filled jars that had been in the oven. It is important to put a waxed disc on the jam immediately to make a sterile seal. Then use pretty lids and labels. The date is important to add to it. As with the cordials, sometimes I use saved jars but if I give them as gifts I use pretty jars and labels and lids. I have the preserves ready for when my adorable, loud, happy family of eaters visit on Christmas Eve . Pictured above are Red Onion marmalade, Marrow and apple chutney, pickled onions and pickled beetroots. This is perfect for Christmas and is a delicious preserve that goes with gammons, hams, pates, cold meats. It is a great way to preserve onions when you have too many too. Soften the onions very slowly in butter, on the lowest possible heat, so they don't go brown. Add the sugar and stir in. Heat the jars in a 110 C oven to sterilise . put the onion mixture in , place a transparent lid on and seal. This should last about 3 weeks . Some high and low pectin fruits can be combined in the sane jam to compensate for one being low pectin . e g apple which is high pectin may be added to low pectin fruits. Other times additional pectin itself is needed. Strawberries, raspberries, blue berries are low pectin and don't set to a jelly or jam consistency without additional pectin from high pectin fruit or pectin itself. Veronica, What pectin-poor fruits particularly benefit from adding lemon or orange? I have added a picture of my preserves for this Christmas ,red onion marmalade, Apple and marrow chutney, pickled onions and pickled beetroots. The rhubarb and orange jam has all been eaten already. I have added my red onion marmalade to this list so you may try it for Christmas to give your family and guests. My family love it. I hope you do too. How interesting that you commented just then, as my son just at that time mailed me and said how he liked the ginger in the jar of jam I gave him. I used ginger that was in a small jar from the supermarket and it seems to have work pleasingly. Adding ginger to jams sounds like a great idea! You're right. That's true and it's all free if it's from the garden or foraged locally. Homegrown fruit is the way ahead I think. Fresh, natural and organic and eaten soon after picking. Rhubarb and raspberry crumble s a big family favourite here. Katie have you tried making raspberry and rhubarb cordial ? An excellent way to enjoy your produce long after the harvest. Oh my your talking about so many of my favorites, rhubarb and raspberries, I grow both myself in me own garden. I have ever berry raspberries, they keep comin on as long as they are properly picked on a regular basis. I eat fresh raspberries everyday. My rhubarb is just starting to get big enough to have more left over after pies. I also have strawberry and blackberry patches.